Our visit was courtesy of Build A Bear and we had a great time in store followed by a rather fab tea party. There was food, party games and of course THE bear himself (who FunnyGirl took more than a passing shine to) and there was the most amazing face painter. We were there to meet their new Children in Need Pudsy Bear - who is rather cute - but possibly not quite as cute as ModelGirl post face painter. Thank you to the Build A Bear team for our amazing day. I for one was wiped out by the fun and games - and it looks like I wasn't the only one! Yeah - OK, she's pretty rubbish at pretending to be asleep - but you get the picture! I bow down to the designer that managed to make good old bear look like a throw back from a fetish club. Just sayin! Fabulous day out, we really enjoyed it. Good to see you and your absolutely gorgeous offspring again. 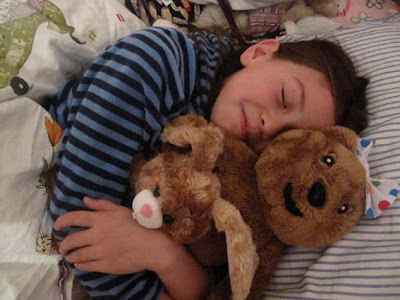 what would you suggest as the youngest age to appreciate build a bear?? What a lovely post, fab video and outstanding day today. Little Miss is properly knackered. 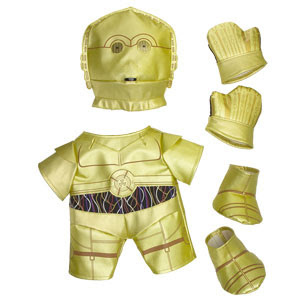 I bet you're going to contact the Build-A-Bear designers to get a big girl C3PO aren't you?? 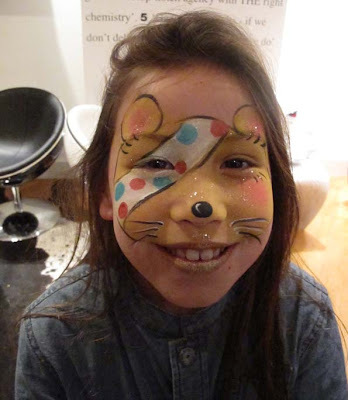 I am Loving that pudsey face paint! Very nice! Sounds like a great time! You are never too old to appreciate a Build a Bear! I was 43 when I got my first one, from Hamleys of course, a Monkey called Freddie who has some fab outfits and ended up costing me a fortune......his boxer shorts are soooo cool!